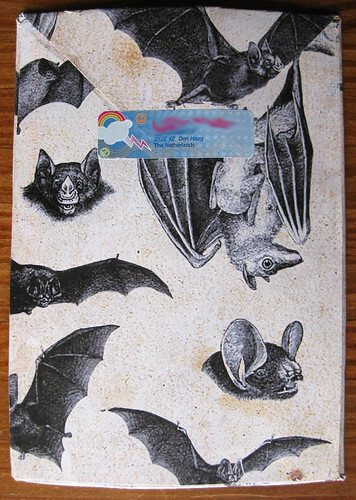 Earlier this month I got a most exciting handmade batty envelope from a blog reader in the Netherlands. I don't know where she found this paper, or if she made it, but the bats are realistic and amazing! I liked the contrast of the rainbows on the return address sticker. I was just blown away by this batty creation. wow talk about mail art . that is some awesome mail art wish I could do as well . totally awesome !!! Bats are the strangest creatures. 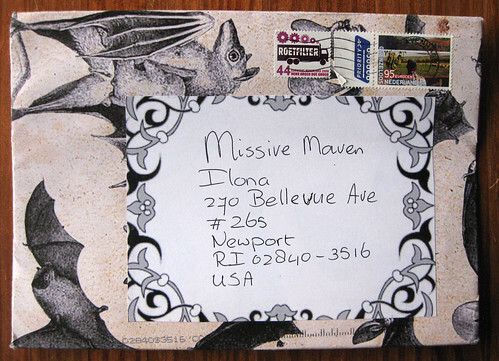 I have a postcard here with a lesser and a greater horseshoe bat, amongst other animals, on it; I will save it for you, missive maven. Also, I wanted to mention that ephemera assemblyman has an interesting post that shows some 'avant garde letter heads', which you might like. Hey Shute - though the mail art is from the Netherlands, I do not believe that is a marijuana leaf. Doesn't hemp have 5 leaves? I could be wrong, but that was my thought. * Saw those avant garde letterheads... interesting stuff. I like the one with the leaves no matter what kind they are. Very colorful. I do believe that is a lovely red marijuana leaf, and very pretty indeed. Love the batty theme, too! Oh wow, okay, I just did some googling. PostMuse and Shute are right. It's a marijuana leaf. 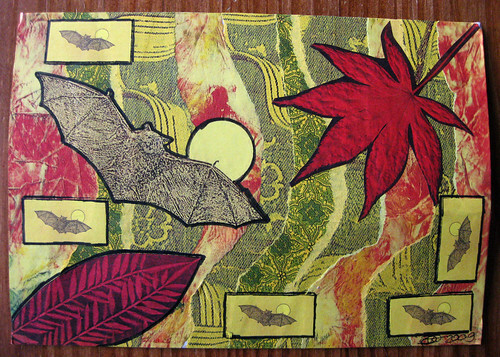 I love the bats and the colors on the envelope. Very inspiring. I guess I will have to create a second one then.